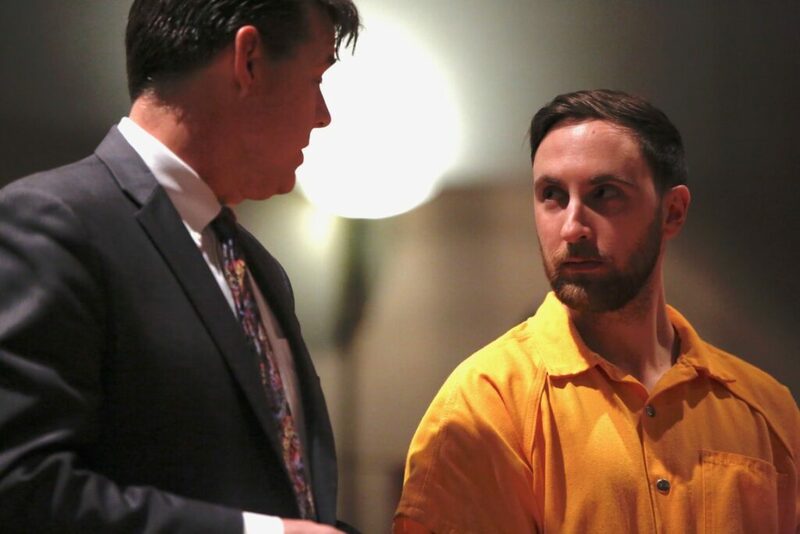 Mark Cardilli Jr. appeared in court Tuesday for the first time since he was indicted and arrested last week in the March shooting death of Isahak Muse. Mark Cardilli Jr. had just returned to Portland, on leave at the end of a five-year stint in the Army, when an argument in his family’s Riverton home escalated into violence. It was 1 a.m. on March 16. His parents wanted his younger sister’s boyfriend, Isahak Muse, to leave the house. As his sister protested and the argument turned physical, Cardilli went to his bedroom and got a handgun. While Cardilli later told police he fired the gun into Muse’s chest in self-defense, a medical examiner reported that the fatal bullets hit the victim in the back. A police affidavit filed Tuesday included those details, the first public account of what happened inside the Milton Street home where Muse died. Cardilli pleaded not guilty to a murder charge Tuesday morning at the Cumberland County Courthouse in Portland. The arraignment lasted less than five minutes. The defense attorney, Jon Gale, addressed the judge and entered the plea on his client’s behalf. Cardilli, 24, did not speak. He is being held without bail in the Cumberland County Jail at least until a more detailed hearing on the preliminary evidence. Muse, 22, died at the scene. A grand jury indicted Cardilli Friday, nearly three weeks after the shooting, and he turned himself in to police that evening. The indictment identified the weapon as a semi-automatic pistol. The affidavit written by police Detective Jeff Tully revealed new details about the fight in the home on Milton Street. In the four-page document, Tully recounted portions of police interviews with the Cardilli family about the night of the shooting. Cardilli had been living at home with his parents and sister since he left the Army earlier in March. A spokesman at Fort Drum in New York said Cardilli was on active duty leave, and his attorney said he was at the end of his career in the military. Muse was dating Chelsey Cardilli, who was 17 at the time of the shooting and turned 18 this week. Her father, Mark Cardilli Sr., told police that she was on juvenile probation and he allowed her boyfriend to visit the home only with parents’ supervision. The reason for the juvenile probation is not disclosed and such records are confidential. When Chelsey Cardilli asked her father if Muse could visit on the evening of March 15, he told her no. But Mark Cardilli Sr. saw Muse come to the house around 10 p.m. on a surveillance camera outside the house. The family confronted Muse, but the parents eventually agreed Muse could stay until 1 a.m.
Mark Cardilli Sr. asked his son to check on Muse at that time. At 1 a.m., Chelsey Cardilli told her brother that their father had given Muse permission to stay overnight. Cardilli checked with his father, who told him that was not true. Cardilli and his mother confronted Muse, and he refused to leave. The argument escalated, and Mark Cardilli Sr. told police that he heard his wife say their daughter punched her. He joined the confrontation and tried to physically remove Muse from his daughter’s bedroom. The affidavit then describes a physical and verbal confrontation among the five people in the house. “Mark Sr. and Mark Jr. continued to try to make Isahak leave the house while Isahak refused and Chelsey punched and scratched her father and brother,” Tully wrote. The mother, Suzanne Cardilli, tried to call 911. When her phone did not work, she went to a neighbor’s house and asked them to call 911 because there was a fight going on in her home. It was 1:42 a.m. When Cardilli went to his own bedroom and returned with a handgun, his sister backed him into the living room. But the fight continued to move into different parts of the house, and Cardilli claimed Muse punched him twice. He told police he then raised the gun and shot Muse two or three times. During the interview, another detective asked Cardilli why he didn’t call the police. There is no indication in the affidavit that Muse was armed. “Mark Jr. stated that Isahak was still actively fighting, it seemed like the right thing to do and it was self-defense,” Tully wrote in the affidavit. Mark Cardilli Jr. then called 911 at 1:45 a.m. to report the shooting. First responders pronounced Muse dead on the scene at 2:08 a.m. When he recounted the shooting in his interview, Cardilli told police that Muse was facing him when he fired the gun. But the affidavit points to contradicting forensic evidence. Dr. Mark Flomenbaum, the state’s chief medical examiner, conducted an autopsy on March 16. He reported Muse had three gunshot wounds – two to his torso and one graze on his left temple. 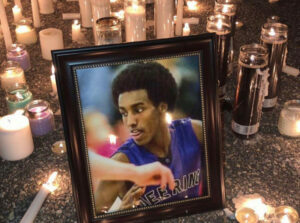 The medical examiner said the gunshot wounds to his torso entered his back, not his front. An evidence technician also reported that blood splatter was low to the floor, which suggested that Muse was not standing when he was shot in the back. A copy of the autopsy report or reports about other forensic evidence were not included in the public court file. The Maine Attorney General’s Office, which prosecutes homicides, declined to comment on the case. Family members of Cardilli and Muse both declined to speak to a reporter Tuesday. Outside the courtroom, Gale declined to say more about what happened the night of the shooting or share more information about Cardilli. Superior Court Justice Nancy Mills has been specially assigned to the case. The hearing on bail, known as a Harnish hearing, will likely be held within two weeks. Gale said he will argue for Cardilli’s release, but he declined to say on what grounds. It is unclear whether the criminal charge will have an impact on Cardilli’s military career. Gale told the judge that Cardilli is at the end of his time in the military but is still receiving his final paychecks. The lag between the shooting and the arrest was a source of concern for members of Portland’s Muslim community. One week after Muse died, city officials met with a group of 40 people at the local mosque. The residents asked questions about the case and expressed their fear that Muse’s killing was a hate crime against a black Muslim man. Acting police Chief Vern Malloch told them he could not disclose any facts about the case for fear of jeopardizing the outcome. Cardilli has not been charged with a hate crime. Gale said he does not believe discrimination played a role in this case. “I have seen zero evidence that race played a role in what happened that night,” Gale said. Muse’s family members thanked the police department in a brief statement Friday. “We are satisfied to hear that an arrest has been made in the murder of our youngest brother, Isahak Muse, but this is only the first step in ensuring justice for him,” the statement said.